The ESSENCE of our "Auzu" vineyard located in Villamayor de Monjardín, at an altitude of 580 metres, a location which enjoys an exceptional micro-climate: dry summers, cool nights and rain at the end of autumn, leading to the development of "Botrytis Cinerea" in the grapes at the end of November, which removes the Malic acid and water from the grapes, increasing the sugar content and giving the grapes its special aromas. December marked the commencement of the evaporation of the water from the pulp and, therefore, the conversion of the grape berries into raisins, thereby concentrating the acids and sugars. For every 20 kilos of grapes, we obtained one kilo of raisined grapes. The grape juice, with more than 450 grams of sugar (30 º Beaume) was fermented in new 300 litre barrels for 40 days. It was then bottled without filtering so as not to lose any of the components. This can give rise to small precipitates. The result is a very fine sweet wine with aromas of compote, figs, honey and a slightly acidic finish which, far from being heavy, makes the wine extremely elegant. Ideal for serving with sweet dishes. The VI Contest Vinos Bacchus 2004 awarded the Silver Bacchus to the natural sweet wine Monjardin Esencia 2000. Peñín guide: Podium Exceptional Wines: Monjardin Esencia, 95 points, a jewel from Navarre. Guía de Oro de Los Vinos de España (Spanish gold wine guide) 2205 awarded Esencia Monjardin 93.5 points and states" An exceedingly late grape harvest taken to its limits. Intense notes of faded flowers together with tones of truffles and thick honey, with a sweetness that is very well balanced by its acidity Keep for more than 5 years." Selected by the Sommeliers Club of Navarre as the best sweet wine. 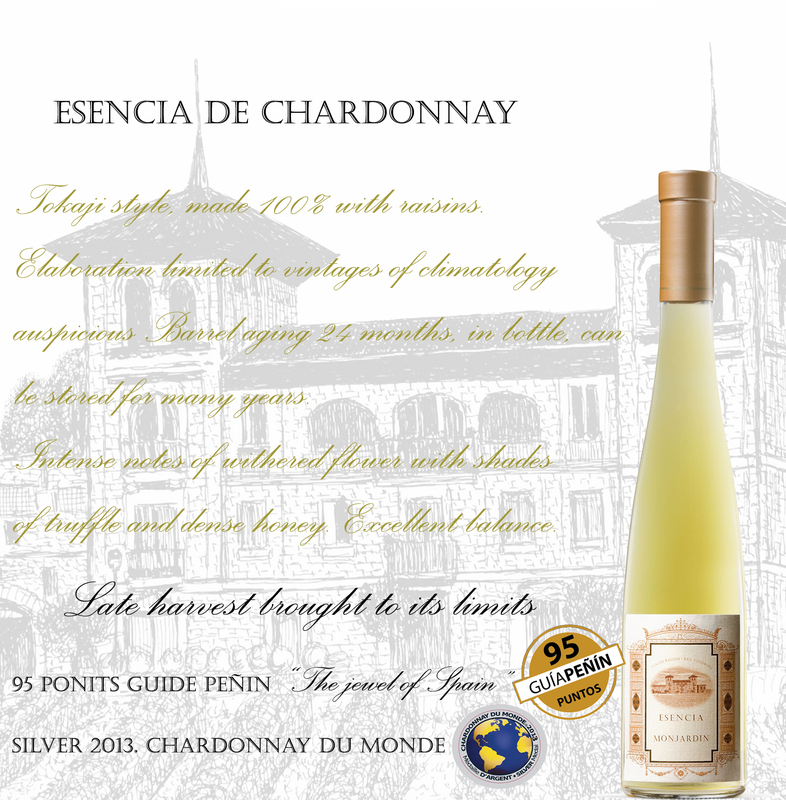 Golde Guide of the Wines of Spain 2005 gives Esence Monjardin 93,5 points and says: "Late harvest brought to its limits: intense notes of withered flowers along with truffle tones and dense honey, with a sweetness well balanced by its acidity. Save more than 5 years". Chosen by the Sommeliers of Navarra club as the best sweet wine.